Here at Ina FWB Church we decide, as a church, which missionaries an at what financial level we will support them each month through our Faith Promise Program. In essence, as a congregation we step out in faith to set a commitment level and then rely on individuals to give through the program to meet those commitments. At times we have used commitment cards or other methods to gauge our congregation and determine where our overall commitments should be set, but in recent years we have simply promoted the program and allowed the giving itself to act as a gauge for adjustment. We have designated the 3rd Sunday of each month "Faith Promise Sunday" as a time for individuals to give their Faith Promise offerings, though they can be given at any time by simply designating "Faith Promise" on the offering. From month to month the faith promise offerings that are collected may or may not equate to the commitment level that we have set as a church. The monthly commitments established by the church are sent to the missionary agencies, regardless of the offerings received. Shortfalls in any given month are made up from the general fund and any excess offerings received are carried over for the next months. On an annual basis, if the level of giving is substantially higher or lower than the commitments from the previous year, the church may elect to adjust the commitments for the following year up or down, accordingly. For this reason, it is important to designate your intended faith promise offerings "Faith Promise" so that they can be included in our assessment of program participation. Why Should I Make a Faith Promise Offering? What is A Faith Promise For Missions? "The Faith Promise Offering for Missions is the amount you promise to give by faith above your tithes during the coming year to the missions program of your church." 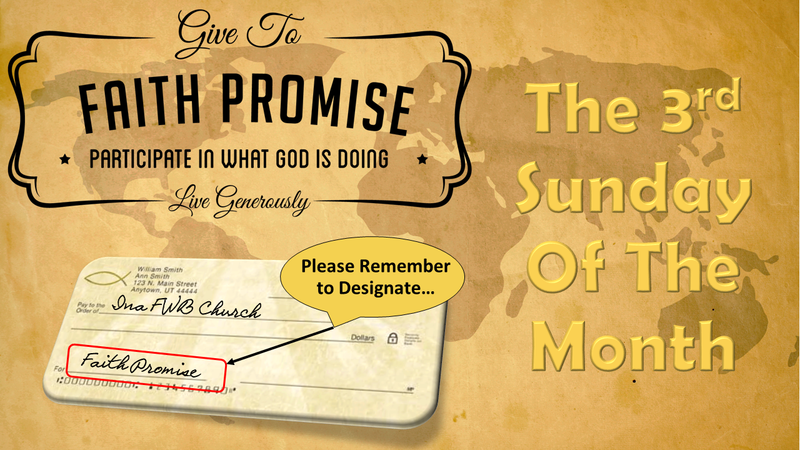 The Faith Promise Offering is a Biblical plan or method of giving. Missions is at the very heart of our Faith Promise Offering. It isn't His will that any should perish. They need to be told of Christ's provision for their salvation. They cannot hear without a preacher. The preachers must be sent. We, the local church, are the senders. Sending means more than praying: It means providing financial support. Differ From a Pledge System? 1. The Faith Promise Offering differs substantially in that it is between the believer and the Lord. The believer is never asked for the offering and is dependent on the Lord's supply. A pledge is between the member and the church. It is a legal and binding agreement to pay. 2. The Faith Promise Offering is totally voluntary and is based upon that which the believer purposes in his heart to give. (2 Corinthians 9:7) A pledge is more a matter of coercion or necessity.